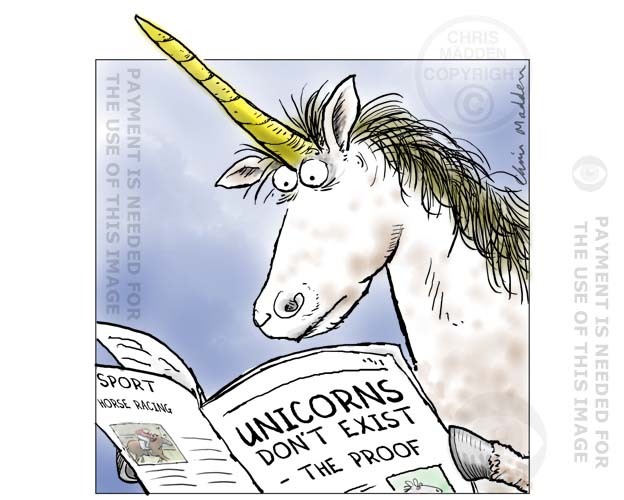 In the illustration a unicorn is reading a magazine or newspaper article with the headline “Unicorns don’t exist – the proof”. The joke is that something that doesn’t exist is reading an article giving proof that it doesn’t exist. The cartoon is based on the fact that generally you can’t prove a negative. For instance, in Britain before the time of ocean-going discovery all swans that were observed were white – however this didn’t mean that there were no swans that were black (as indeed there were in Australia). The argument is often applied to religion and the subject of attempting to prove the existence of god. Believers in god frequently ask nonbelievers to disprove the existence of god. Atheists have to reply that disproving the existence of god is similar to disproving the existence of unicorns. The onus is really on the believer to prove the existence of god (or prove the existence of unicorns).